Should the government log Bowen? The attempt of BC Timber Sales to rush through a ‘consultation process’ during the summer of 2017 resulted in a wave of protest from hundreds of Bowen Islanders. One petition against logging gathered 1820 names. A few days before their planned public meeting, BCTS pulled out, citing a deadline for the submission of their Forest Stewardship Plan that would be blown if they tried to continue on Bowen. As a result, Bowen was not included in the 2017 FSP, which we celebrated with great relief and enthusiasm. However, BCTS made it clear that just because they abandoned the process this year, the BCTS lands on Bowen Island are still subject to logging in future. 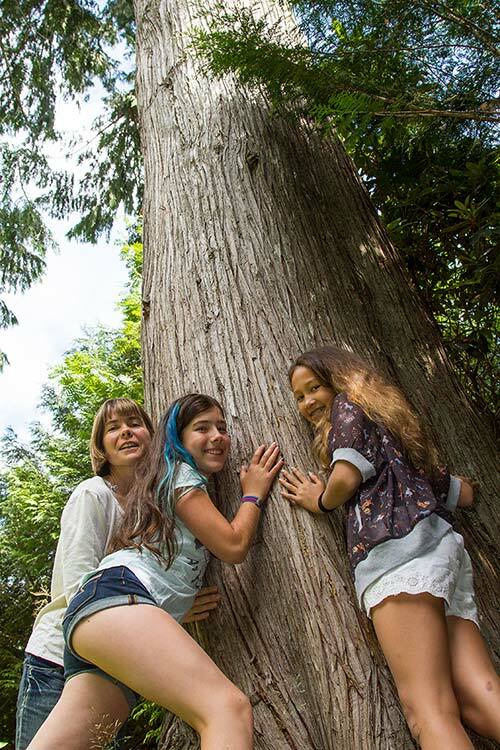 Since then the Bowen Island Municipality, Defend Island Forests, the Bowen Island Conservancy and other groups and individuals have been working behind the scenes to try to line up a new status for the Crown Lands on Bowen Island that precludes logging. 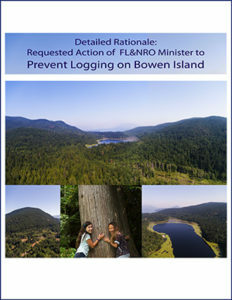 April 2018: current strategy is to find a way to more securely protect Bowen from logging until a new land designation can be achieved. 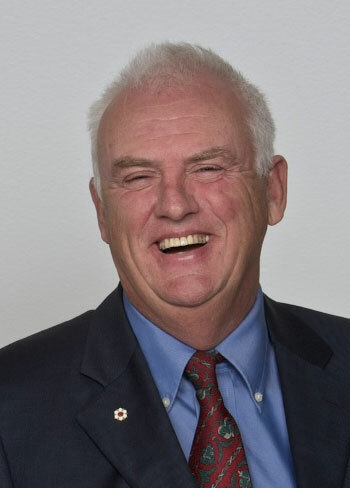 The Minister of Forests, Lands and Natural Resource Operations, Doug Donaldson, says he wants to dig deep into the issues with islanders – and include BC Timber Sales in the discussion. Meanwhile the Municipality and Defend Island Forests are discussing the possibility of Metro Parks expanding Crippen Park onto Crown Lands. Read the update. Please do sign up to our newslist so we can keep you informed. For example, we have Save just posted a video showing how logging Bowen would affect views. #1 : come celebrate our victory on Sunday, July 30 at 1pm in the Bowfest Field! UPDATE: On July 26th, BC Timber Sales withdrew Bowen Island from FSP #643, but vowed to come back another day to promote Bowen Island logging. 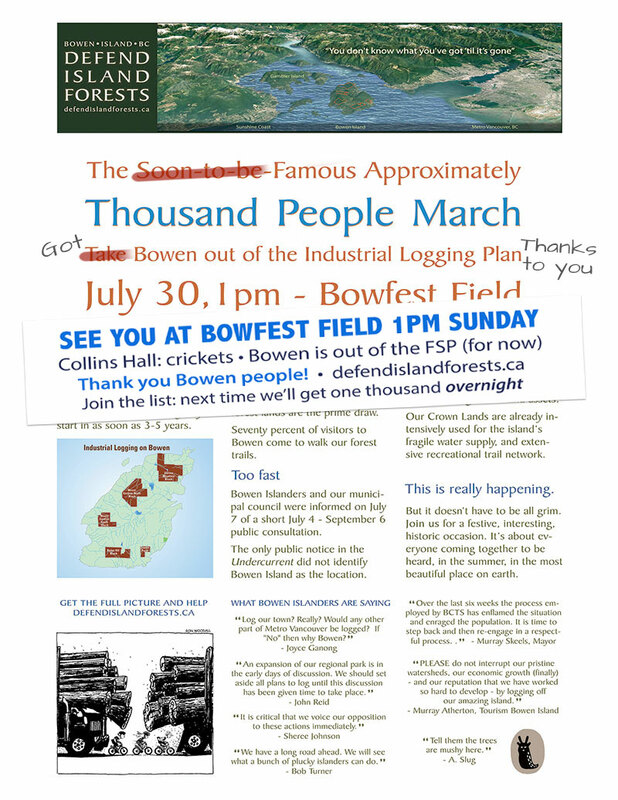 We’ll celebrate our unexepected and almost anti-climatic success with a gathering at the Bowfest field at 1pm on Sunday July 30th. We were looking forward to seeing a thousand people, but at least we can toast what a bunch of “plucky islanders” can do. “BC Timber Sales (BCTS)–Chinook is cancelling the open house scheduled for July 30, 2017 on Bowen Island. BCTS–Chinook has decided to remove Bowen Island from its current Forest Stewardship Plan (FSP) proposal, since there are no immediate or mid-term harvest plans for the island” said BCTS Woodlands Manager Tom Johnson. 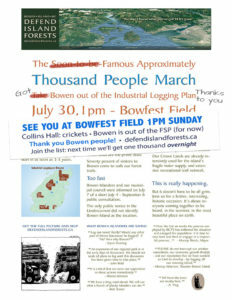 He added “It is important for residents to recognize that this does not exclude Bowen from the timber supply land base… We will continue to engage the community on a harvesting strategy.” So logging on Bowen Island is just a matter of time from his perspective. From their perspective, it’s just a matter of time. So let’s use this time to find a new designation to protect the forests, and build our email list so that next time, we can mobilize 2,000 people overnight. Defend Island Forests was created in response to an initiative by BC Timber Sales, a government agency, to include the island in a ‘Forest Stewardship Plan‘, which would require logging by law on Bowen Island. There has been an overwhelming response by islanders that we stay out of the FSP. If this FSP were enacted on Bowen Island, BC Timber Sales says it would expect to be logging 8,000 cubic meters of high grade trees per year. By one measure that would entail 250 truckloads of logs every year rumbling along Mr. Gardner Road past BICS, or along Adams road around the corners, down the hill into the Cove, to join us on the ferries, plucking out about a quarter of Bowen’s forest over twenty years. We are told we have no choice. The consultation period would end September 6th. 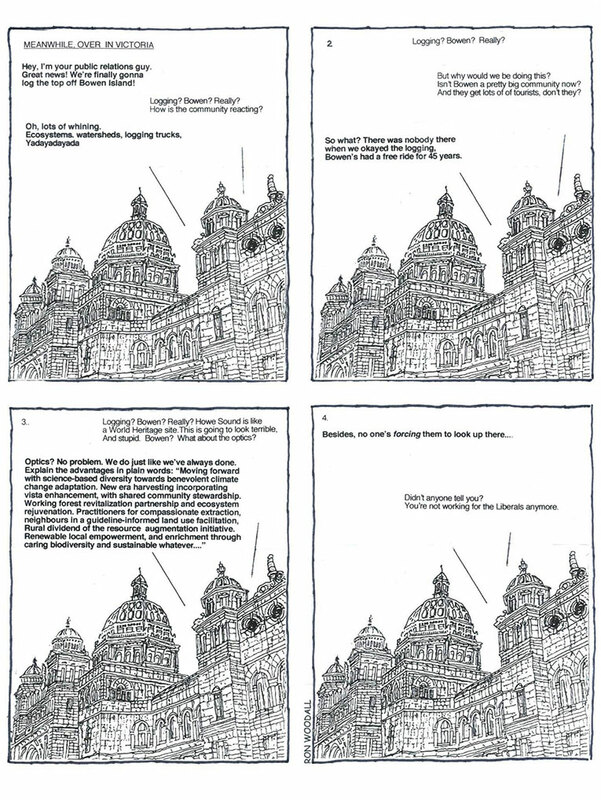 In communities all over BC this process, once started, could not be stopped. So as a community, we stopped it before it could start. Bowen has a storied past. A situation like this has the potential to divide the community, or bring us together. We hope everyone will discuss the issues openly and thoroughly, as groups may have different takes on the matter. It’s a conversation everyone should be part of, and how we hold that conversation can build trust. So the Soon-to-be-Famous Approximately Thousand People March is now famous for succeeding without even happening. At Collins Hall on Sunday: crickets. At Bowfest Field: spontaneous celebration. Please explore: we have photos, maps, letters from the community, and some very deep research coming over the next few days. You can sign up to our mail list for the latest updates below. We could use your help, so if you’d like to volunteer to help with research, social media, or in other ways, please contact us at info@defendislandforests.ca. please send photos of Bowen Island to people in Vancouver, the rest of BC and the world to grow awareness of this beautiful island in its current state – available for free on our photos page with a link to defendislandforests.ca – tell them what happened here. join our email list (below) – and ask others to join the list – so that next time we can mobilize 2,000 people or more overnight if necessary. Thanks so much for what you as a community accomplished this week, and imagine what you can accomplish in future. April 2018 Update: Read it here. • Please ask Bowen Council to endorse DIF before 8pm on Monday April 9th. • What if they could expand Crippen Park? May we keep you up to date? If something exciting happens, you’ll be the first to know. 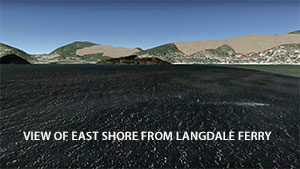 A team from Defend Island Forests has completed a comprehensive briefing document about why and especially how Bowen Island can change in status from ‘loggable’ to ‘not’. This roadmap gives the Minister of Forests, Lands and Natural Resource Operations a very specific set of options for doing this. It would not be the same as permanent protection, but an important step on the way. It’s quicker and less controversial in the short run. Note, the links to references cited in the PDF work on most computers, but not on some mobile devices. Ric Careless has led campaigns that have protected 10 million acres of land as parks and wilderness, including Tatshenshini, Spatsizi, Central Purcells, Height of the Rockies, and Nitinat Triangle in Pacific Rim. 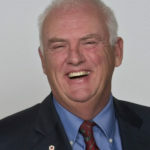 Ric was a co-founder of the Sierra Club in BC, and has received numerous awards for his work, including the Order of BC. The Bowen Island Conservancy hosted Ric for a talk about dealing with BC Timber Sales and their tactic of the ‘community forest’, which he says can tear communities apart. He is a vital source of information about how to respond.